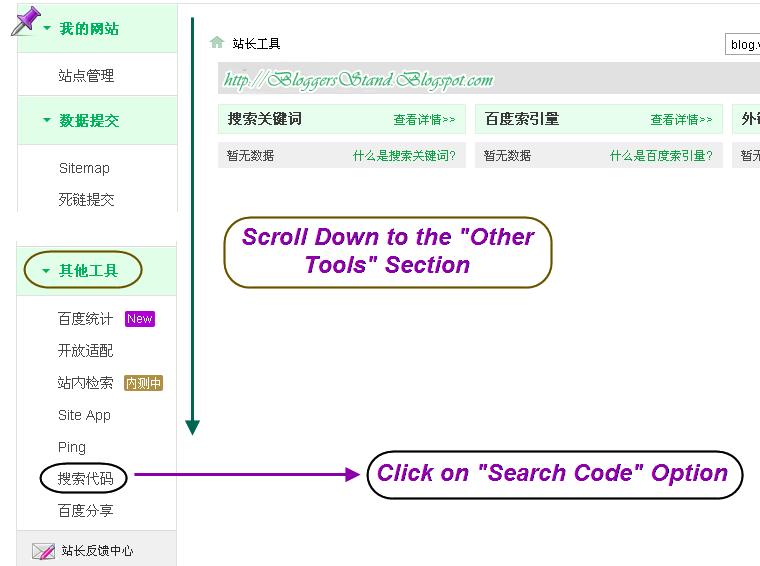 Baidu Webmaster Tool Translated in English | BloggersStand ';-1!=b.indexOf("img.youtube.com")&&(a=' ');d=a+''+p+''+titlex+"
Baidu is a leading search engine in China with more than 75% of market share. You can submit your site to Baidu anonymously as well as through Baidu Webmaster Tools. 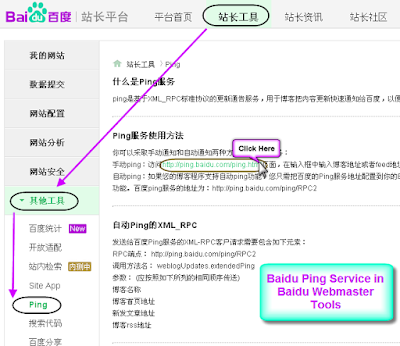 Unlike Google, Bing and Yandex Webmaster Tools Baidu offers Webmaster Tools only in Chinese language. It is worth to consider submitting your site to Baidu since the traffic potential is very huge with over billion of Chinese users accessing internet. Register Here for Baidu Webmaster Tools. Provide the details and submit your information, you will receive a success message saying that the verification mail has been sent to your mail id. 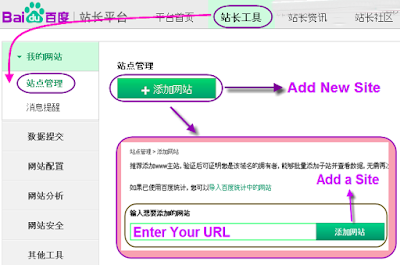 You will receive a confirmation mail and once you activated your account, log in here to Baidu Webmaster Tools account. Baidu webmaster tools offer various features for webmasters under six categories as shown in the below picture. After login select “Add New Site” button and enter correct URL in the subsequent screen. 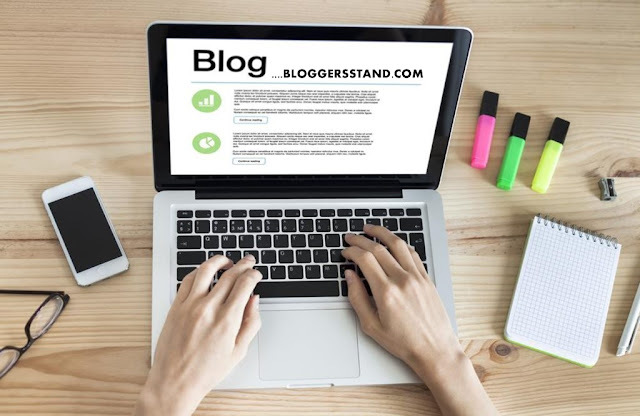 Note http://bloggersstand.com and http://www.bloggersstand.com are considered as two different sites; hence add your correct site with or without www. Choose the appropriate verification method, the common method is to Copy and paste the HTML code in your site’s header section. Publish your site after pasted the verification code and then click on the verify button. 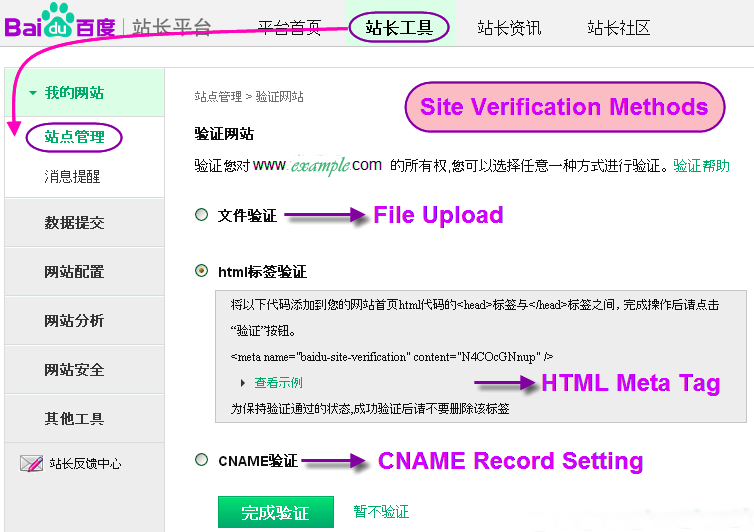 Your site will be added to Baidu Webmaster Tools account once verified successfully. You also have an option to cancel the verification and verifiy it later point of time. 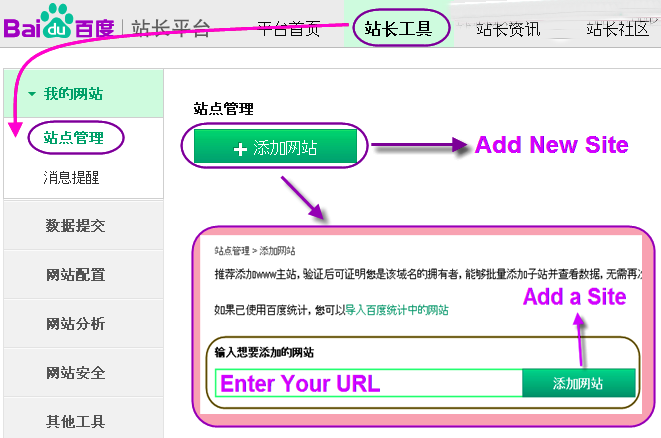 Whenever the content or URL of your web page is changed then you have an option to add that particular individual URL in Baidu webmaster Tools as shown in the below picture. The option is available under data submission section. Enter your page URL, verification code and click OK button, you will see an success message box showing that your URL is added. Remember submitting URL does not guarantee that Baidu will index your pages immediately, it may take several weeks for Baidu spider to crawl your site. Baidu does not allow you to submit your Sitemap; this feature is available only on invitation basis. Based on the content quality of your site Baidu will inform you to add a Sitemap and then this option will be enabled in your webmaster Tools account to submit a Sitemap. 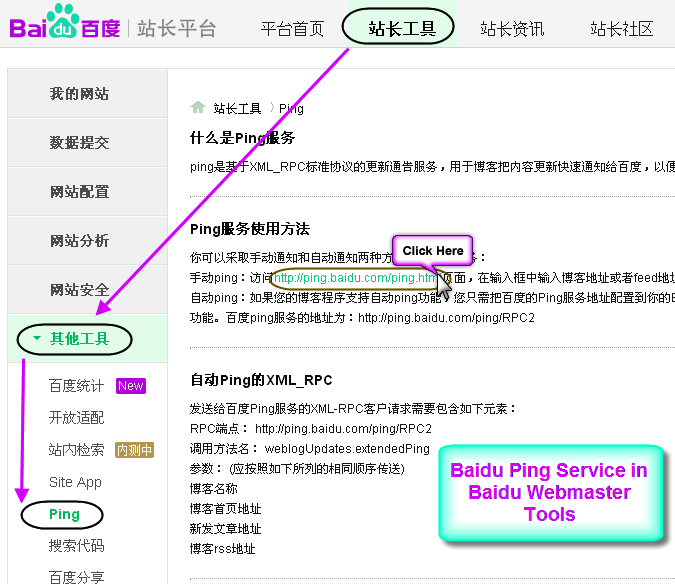 Ping is a tool to submit your blog feed to Baidu. 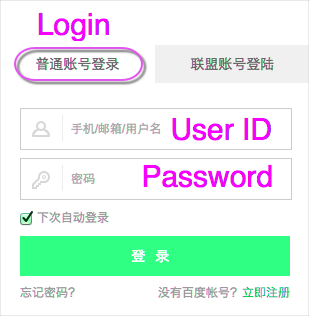 You can also directly access this tool here without registering for Baidu Webmaster Tools. Ping is based on “XML_RPC standard protocol update notification service” for blog updates. This will quickly notify Baidu to crawl and index your blog posts in a timely manner. You can either manually submit your blog feed or configure for auto feed submission. Using Standardized formats helps the search engines to index your pages easily. This tool helps to detect whether a page is search engine friendly and gives recommendations. You can submit important pages in your site to get optimization recommendations. Note you can submit only one page at a time and recommendations for each page will differ as it is the case. 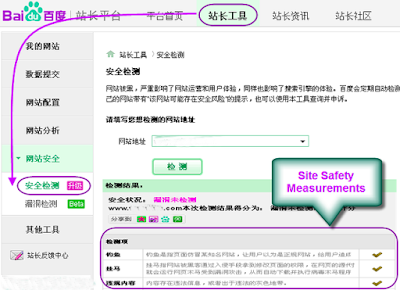 Check your site is not hacked and free from malware by using Baidu’s security detection tool. In case if your site is affected Baidu will display a warning message in the SERP. The warning message can be removed from the search results page by rectifying the issue and resubmit your site again. Enable Baidu custom search box in your site pages by copy & pasting the HTML code from Baidu Webmaster Tools. 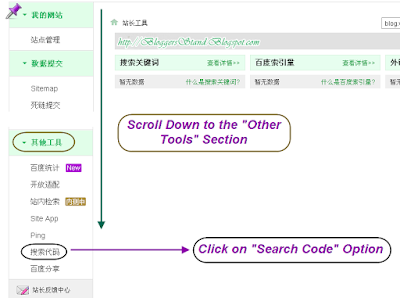 Learn more about getting Baidu Search Box code. 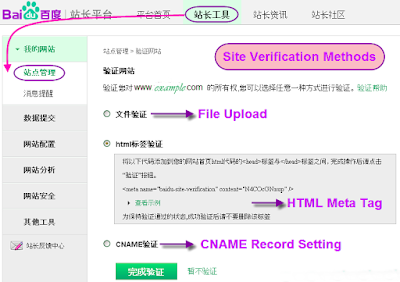 baidu webmaster guidelines,baidu webmaster in english,baidu search engine optimization,how to use baidu,submit your site on baidu,verify,baidu tools registration,add url in baidu,how to ping baidu search,biadu pae optimization suggestion tool,baidu seo,baidu security detection tool,baidu search box. 0 Comments on "Baidu Webmaster Tool Translated in English" So Far - Post Yours!